March 11, when the earthquake and tsunmai hit, was surreal. And left lasting impressions on Japanese spirit. What was really unnerving was what I noticed when I was on the street outside. Usually when you’re standing around outside you won’t even realize there’s an earthquake going on. But even though the tremor had been going on for what felt like a couple of minutes (which feels like much longer as it’s happening), the street beneath my feet seemed to be swaying from side to side. I wondered when it would end. It turned out to be a magnitude 9, in northeast Japan. We didn’t know at that point how the quake itself would actually be the least of the problem for so many thousands that day. About half an hour after the first quake hit, the park beneath us started to sway. Some people shrieked. A weather vane or antenna on top of a building by the park swayed ominously. I’d never felt anything like it – the ground swaying beneath me, having to steady myself. When you’re a journalist you can never quite focus on just dealing with the moment. There’s a story to be told – people all over the world will be wondering what’s happening. So we headed back to the office and tried to tell that story. The internet was down only briefly and we were able to get some updates up – about how it felt and what was going on. From that afternoon until I left Japan a few months later, it was hard not to pause for a moment and wonder if this was going to be another big one. Until that day I’d always assumed they wouldn’t, because none of the scores of others I’d felt and not even noticed had amounted to anything. I exchanged regular emails with The Diplomat’s publisher, based elsewhere in Tokyo, who with his usual sense of understatement had noted that “it’s difficult to concentrate on work with these aftershocks.” And it was – they felt like they were coming every 20 minutes. The room would shake, sometimes vigorously, we’d pause for a moment, ready to get under the desk or head for the exit. Unsurprisingly, the trains had stopped working as it came time to head home. I was with a colleague, and on seeing what we guessed were at least two hour taxi lines, we decided to just walk in the direction of my apartment. I lived in Tokyo, he lived half an hour outside, so I knew he had no chance of getting back to his place that night. So we walked, and walked, and walked. It was a 30 or 40 minute subway ride back to my apartment, so I’d never tried to do the walk home before. I knew roughly the direction to head, so we just thought we’d walk as close as we could before we got tired and got a taxi. If there were any available. The good thing about Tokyo is that you’re pretty sure that no matter where in the city you are, no matter what time of day, that you’ll be safe. So walking the unfamiliar streets wasn’t a worry. 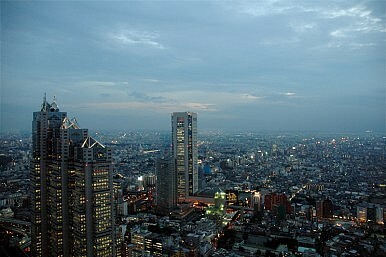 And it’s strange seeing the bits that join up the bits you spend time in, in a place like Tokyo. I was so used to shuttling from one area to another by subway, that I hadn’t seen all the areas in between. I remember thinking to myself how orderly everything was. Long, long lines of Japanese waiting calmly for taxis. No one shouting, no one pushing or panicking, even though everyone wanted to get home and check everything was OK as soon as they could. That proved to be one of the extraordinary and heartwarming things about those tragic and very dark days that followed, as the tsunami death toll climbed and the Fukushima nuclear disaster loomed over Tokyo. I had to evacuate New Orleans for Hurricane Katrina (I was also in Washington DC on September 11, 2001 and in London for the underground bombings in July 2005 – disaster seems to follow me around), and the images on the news were of looting, and of emergency services coming under fire as they tried to help people. Then there were the awful stories of the squalid, sometimes violent conditions at the Super Dome, which had been turned into an emergency shelter. In Japan, these people who had lost everything were sitting in cramped gymnasiums, and yet they sat there quiet, calm, each family with its own mat to sit on, shoes placed neatly to the side. Yes, there was some looting in Japan, but considering the scale of the disaster and the opportunity for trouble, the orderliness and that much-used word “stoicism” were dominant throughout the aftermath of the tragedy. And guess what? Japanese ended up returning an estimated total $78 million in cash that they found. Frankly, it’s hard to imagine that happening in any other country. I stopped on the way home with my colleague for something to eat. We found a restaurant that was surprisingly busy – we weren’t the only ones having problems getting home. The atmosphere reminded me of how it felt when we had fled to a restaurant outside Washington after September 11 while we waited to see what was going on. People were strangely calm, the atmosphere somewhat hushed. But there was a feeling somehow that we were all in this together. I was lucky that day – I didn’t lose anyone in this or any of the four tragedies I’ve been so close to. And for that I am always thankful. But every March 11, like September 11 each year, I’ll always remember exactly where I was when it happened.